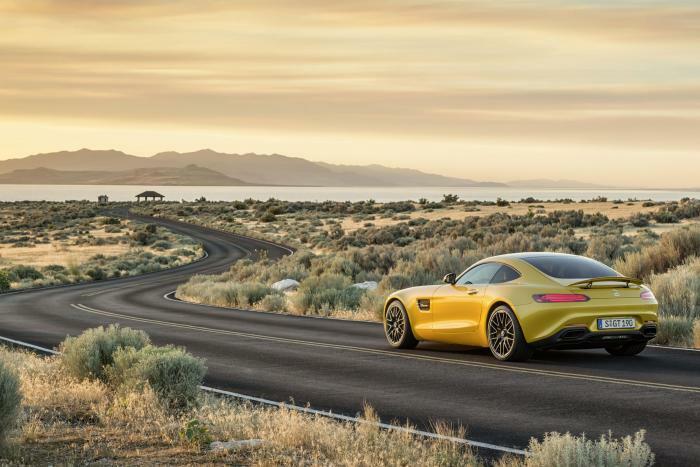 Set to go toe-to-toe with the Porsche 911 and the Jaguar F-type, the new Mercedes AMG GT has been revealed to the world and looks to be everything we hoped it would be. The stunning two-seater doesn’t exactly take over from the SLS and isn’t a direct replacement, but armed with a brand new gutsy turbocharged 4.0-litre V8, the GT has it where it counts and becomes Mercedes’ new flagship sports car. Two versions of the sleek coupe will be offered from launch: the GT and the GT S. The duo receive the same powerplant but in different tunings; the GT offers 456bhp on tap whilst the GT S gets the full 503bhp, both through a seven-speed dual-clutch gearbox. A 0-62mph time of 3.8 sec is achievable for the latter, with a time of two-tenths behind that for the standard car. There’s no denying the Mercedes AMG GT is heavily inspired by the elegant shape of the awesome SLS, but it also takes cues from the new S-Class Coupe, especially at the rear of the car. As long bonnets go, the GT is up there with the F-types of this world, while the SLS influence is very much evident when observing the GT’s immense rear haunches. The GT S differs from its standard counterpart due to its gloss black front splitter and a GT S badge on the rear; a Chrome package can be specced on either model, as well as a Night pack and carbon fibre parts. The GT is built upon a similar aluminium space frame to the SLS – minus 50mm cut out of the wheelbase – and weighs 1,645kg, making it 25kg less than the 911 Turbo and 5kg less than the F-type R Coupe. A traditional AMG centre console dominates the GT’s interior and is joined by a new touchscreen borrowed straight from the new C-Class. Additional buttons in the roof control seat heating, hazard lights and the extendable spoiler. Meanwhile, a 350-litre boot is apparently enough for two bags of golf clubs. Going up against a car so dynamic as the 911 Turbo, the Mercedes AMG GT requires the kit to contend with such ability in the corners and so receives a double wishbone suspension set-up all-round, as well as adaptive dampers that can be set between comfort, sport and Sport Plus using the AMG Dynamic Select system. An AMG Dynamic Plus package is also available for the GT S, which includes active engine and transmission mounts which work independently from each other. Carbon fibre brakes and Michelin Pilot Sports Cup 2 tyres can also be specced. A selectable exhaust comes as standard with the more powerful version that allows the driver to have more or less of the V8’s bellowing depending on which mode the Dynamic Select system is in; the standard GT model can have it as an optional extra. 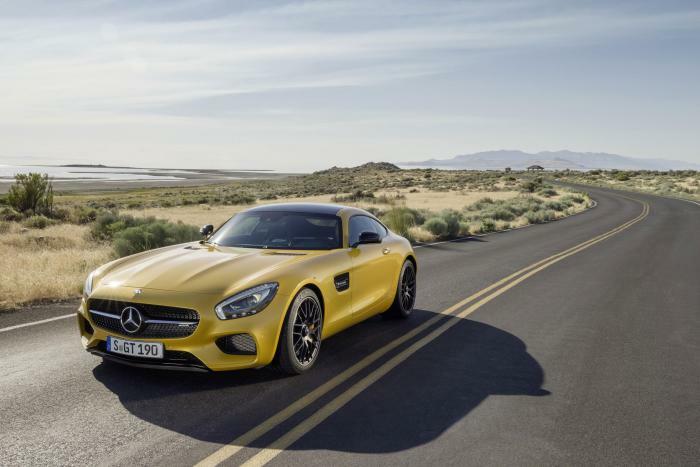 Making its public debut at the Paris motor show in October, the new Mercedes AMG GT will start at around £110,000 for the entry-level model and upwards of £120,000 for the S, with the order book opening at the start of 2015.